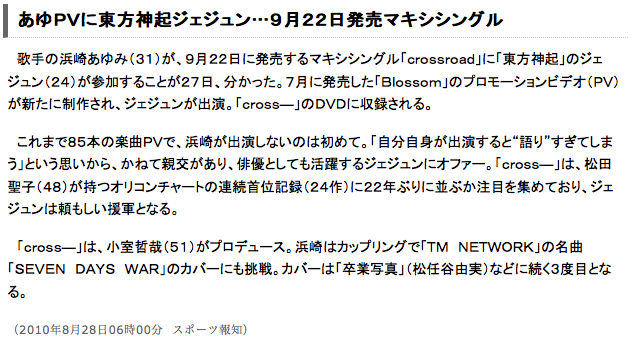 It was announced on the 27th that Tohoshinki’s Jejung will be participate in Ayumi Hamasaki’s single “crossroad” which is going to be on sale on 9/22. He will be making an appearance in the PV (promotional video/music video) of the song “Blossom” that was already released in July. The music video will be included in the DVD of “crossroad”. This will be Ayumi’s 85th music video and this will also mark the first time ever that she doesn’t appear in her music video. She says, “If I appear in the music video by myself, I might be “talking” way too much,” thus making an offer to her friend Jejung who has also started his activities as an actor. “crossroad” will be challenging the record of having the most number of singles ranked first on the Oricon chart that Matsuda Seiko created 22 years ago with 24 singles; and Ayu trusts Jejung in helping her with that challenge. Beside the video clip and making clip of “crossroad”, the DVD will also include the video clip of “blossom”! For the first time ever, Ayu won’t make an appearance in her on-the-spot music video*, and the super popular aritst Jejung will be making an appearance instead! This is a must-see video clip with realistic acting that will make you cry!! T/N: Just before everyone gets confused, this single is called “crossroad” and “Blossom” is one of the songs in the single. The song “Blossom” was already released in July with another single, but they decided to include it again in this single, together with a video clip for the song.